New Hampshire’s muzzleloader season continues through November 7, and the regular firearms season starts November 8. According to Deer Biologist Dan Bergeron, the 2017 total estimated kill to date is 3,276, up 4% from last year at the same point. The 2017 total at this point in the season is the fifth highest in the past nine years. Hillsborough, Rockingham, and Grafton Counties, respectively, are showing the highest registrations to date. See a breakdown of results to date by county at www.huntnh.com/hunting/deer-harvest.html. The Youth Deer Hunt weekend took place October 21-22, and the "unofficia" reported youth kill total was 223 deer. This preliminary total is down 13% from the official 2016 total of 257, but this figure may change as all registration information is entered and verified. Hunters are reminded to NOT USE urine-based lures. These products have the potential to spread Chronic Wasting Disease (CWD), a neurological disorder that is always fatal to white-tailed deer and moose. Synthetic lures are strongly recommended. If the bottle or package does not say “synthetic,” the product is most likely natural urine. Do your part and help our deer herd. Learn more at www.huntnh.com/wildlife/cwd. The November/December issue of NH Wildlife Journal magazine features an article by Deer Biologist Dan Bergeron about how New Hampshire’s deer seasons are set – and how careful management has grown the herd. Learn more at www.huntnh.com/hunting/deer-mgt.html. You’ll also find a recipe for Venison Bolognese. Just as with targeting a deer, patience pays off as this sauce is cooked "slow and low" and is well worth the wait. Subscribe to the Journal or buy past issues at: www.huntnh.com/pubs/wj-magazine.html. New Hampshire’s 2017 moose season wrapped up with hunters taking a total of 37 moose – 25 bulls and 12 cows – according to preliminary numbers from Moose Biologist Kristine Rines. Hunters achieved a 68.5% success rate during the 9-day season. Around the state this year, preliminary numbers show moose hunters having an 80% success rate in the Connecticut Lakes Region; 71% in the North Region; 69% in the White Mountain Region; 100% in the Central Region; and 0% in the Southeast Region. No permits were issued in the Southwest Region. Check out regional harvest results and a gallery of photos and stories from successful New Hampshire moose hunters at www.huntnh.com/hunting/moose.html. Bear Project Leader Andrew Timmins reports as of November 1, a total of 467 bears (260 males, 207 females) have been brought in by New Hampshire hunters. Bait hunters harvested 316 bears, still hunters/stalkers have taken 87 bears, and hound hunters have registered 64 bears. A spike in bear harvest will likely occur during the remainder of the bear season due to the overlap (in select regions) with muzzleloader and firearms deer season. Due to the abundance acorn crop, bears (particularly males) will remain active later into fall, which often results in increased bear harvest between late October and mid-November. The harvest during this period is higher during abundant food years as compared to poor food years. Apprentice License: Don’t forget the apprentice hunting license, an option for those ages 16 and older who want to try hunting, but have not yet taken Hunter Education. 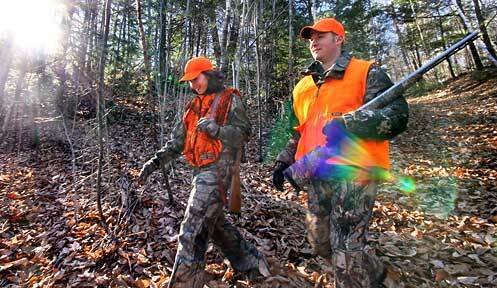 It allows hunting under the guidance of a licensed hunter age 18 or older. Apprentice licenses are available only at Fish and Game headquarters. Learn more at www.huntnh.com/hunting/apprentice.html. Share the Bounty: Hunters are reminded of the New Hampshire Food Bank’s need for venison donations. Call the NH Food Bank at (603) 669-9725 or visit www.nhfoodbank.org to find out how you can help those in need.